From surviving a close encounter with a South African lion to accidentally propositioning a Cambodian prince, join singer Melanie Gall for tales of peril, adventure, romance and humiliation, as she shares songs and stories from a life on the road. From the creator of last year’s 4 1/2 STAR cabaret We’ll Meet Again and Edinburgh Fringe 5 STAR sell-out show Piaf and Brel: The Impossible Concert. My first encounter with Melanie Gall occurred at Fringe 2016 where her commanding voice immediately handcuffed my attention. I’ve seen hundreds (if not thousands) of Fringe performances and Gall has one of the greatest singing voices among all of them. Trained as an opera singer (she has five musical degrees! ), Gall’s voice transcends much more than operatic arias. In her past shows, Gall highlighted famous singers with a journey through their bios. This year, Gall decided to highlight her own journeys as she has toured the world many times over, traversing 58 countries in the meantime. 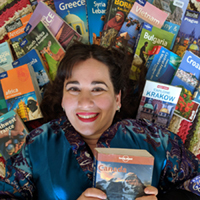 As an accomplished story-teller as well as professional singer, Gall engagingly takes us on some of her adventures through foreign lands, highlighting some escapades in song. I’m used to seeing Gall adapt song-after-song effortlessly as she entrances you into the moment. Today, I sense that she’s taking on some songs that are a bit out of her normal comfort level, which is great. That doesn’t take anything away from another tremendous performance, despite some audio difficulties. As a last minute addition, the show includes some travel photos, which really help bring the viewer into the moment. Exceeding my expectations again, Gall delivers another performance that I will remember as one of my favourites of Fringe—bravo! The main entrance requires you to climb 75 steps up four floors—don’t let that stop you from seeing the show though. If you have mobility problems, the kind folks at Creative Manitoba are happy to lead you to their elevator.